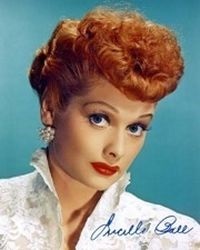 Memories of this lovely lady are of a comedian star, Lucille Ball in the "I Love Lucy" sitcom. Today marks the date of her birth. Two matters came to mind: One is the common age of 77 so familiar as the age of people close to me in the past. Two is the year of her death, 1989. Values passed on beyond her death include though-provoking quotes and films for entertainment especially by those mature enough to remember her in the 1950's and 60's, In September of 2015 it was my privilege to spend several days and nights with Dr. Stanley L Morris, translator of the International English Bible (www.iebible.net) where my own schedule conformed to the Morris tradition. Stanley began his work about 3:30 AM. About 9:30 he came into his living room, played the piano and sang while his bride fixed breakfast. While enjoying breakfast I fit into his tradition of watching a re-run of the old "I Love Lucy" shows. Then it was time for a nap around 11 AM, then back to work on his Bible projects, recording etc. Very methodic, structured and disciplined! Two of my major mentors died the same year as Lucy, Earl Nightingale and Carl Ketcherside. Earl was referred to as the "Dean of Personal Development" and best known for his famous recording, "The Strangest Secret" and was heard on many radio stations throughout the free world. His mentorship continues especially in the realm of growth in the wisdom of man in creating success. Carl, much like Earl's breakthrough came in 1951. Carl was mentor to many in the wisdom of God part of life. The two areas (cumulative wisdom of God and man)though unique fit together like a puzzle to enrich well-rounded enthusiasts. Thanks are in order for the services of Lucy, Earl and Carl for their services which are much alive beyond their colorful and life-enhancing contributions to make life an adventurous experience.